When the children are in school in the wintertime, they are kept so busy that it really uses up their energy by the end of the day. The same thing cannot be said during summer vacation. In fact, it is typically a constant struggle for parents to find things for their children to do to keep them happy and satisfied. Of course, many children would be perfectly happy to just have an electronic device in their hand at all times but we recognize that is not the most healthy option for them. We would rather see them do something productive and creative to help build up the mind and keep them busy during the summer months. There are many projects that may come to mind when you think about the possibilities, but you probably never thought about this project before. As you’re about to see, however, it is absolutely perfect. Many children enjoy doing crafts and parents may enjoy doing them as well. In this video and the following instructions, you will see the perfect way to get together with your children and shake things up with an ideal and beautiful craft. It is something that is fast to make but after you make them, you will find that it keeps your children satisfied and even calm for hours on end. They are shakable bottles that are perfect for use around the home or you can take them on a car ride with you to keep things settled down in the automobile. The beauty of this particular project is that you can make it with items that you likely already have around the home. All you really need is the ideal container with a lid so that your children can carry them around with them and enjoy their own handiwork all summer long. Gather all needed materials for the chosen bottle. Pour warm water (ensure it is warm water!) into your bottle. Pour glitter of choice into the bottle. Add glue. We eye-balled the amount needed based on the size of the bottle. 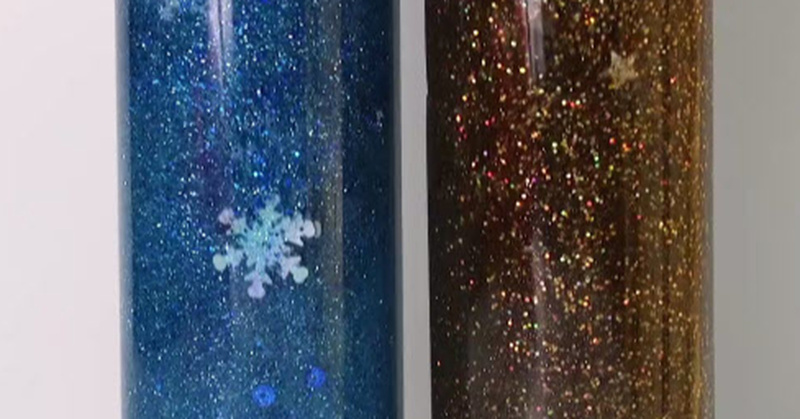 If you want the glitter to move more slowly, add more glue, if you want it to move faster, add less glue and more water. Add soap until the bottle is full. Glue the lid to seal bottle. Optionally, wait a couple of days to see how fast/slow the glitter is falling. You can feel free to adjust and add more water/glue before gluing the lid. Decorate the lid with stickers if desired.